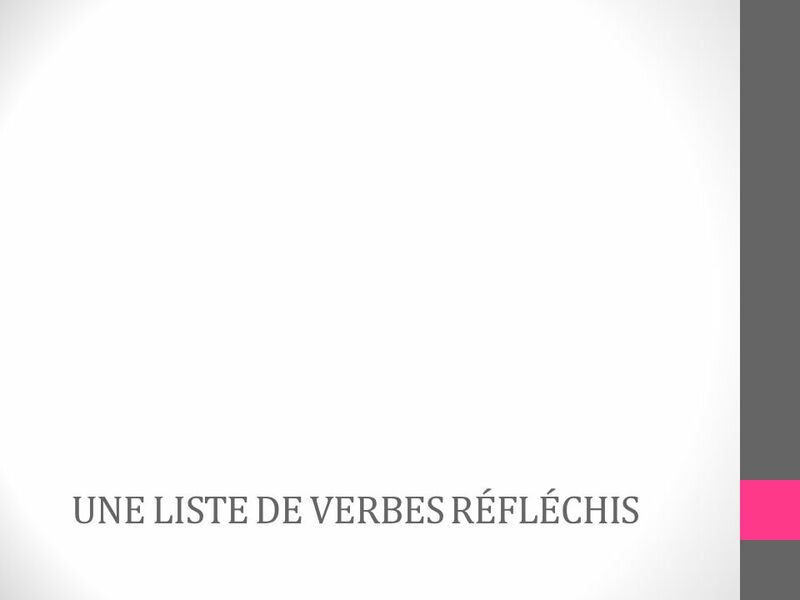 Les verbes réfléchis Reflexive Verbs. What are pronouns? 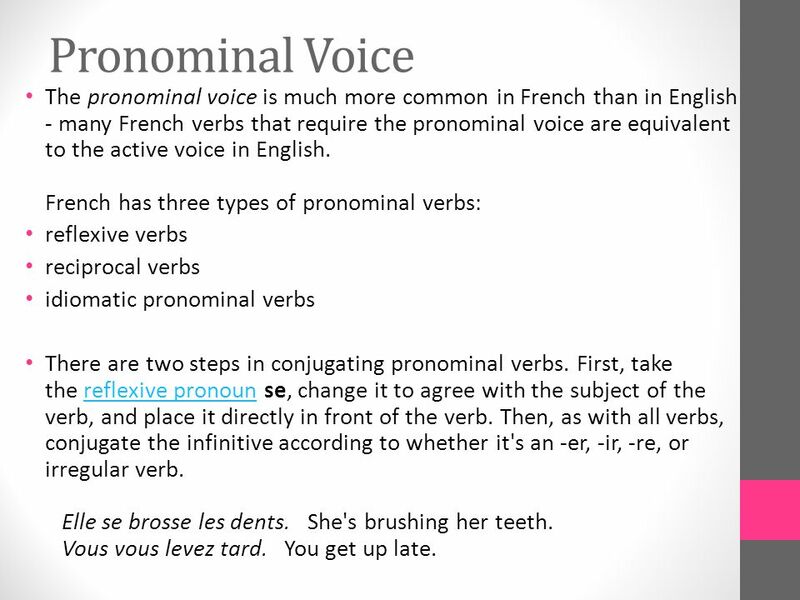 Pronouns take many forms and perform different actions Subject pronouns : Personal pronouns that. 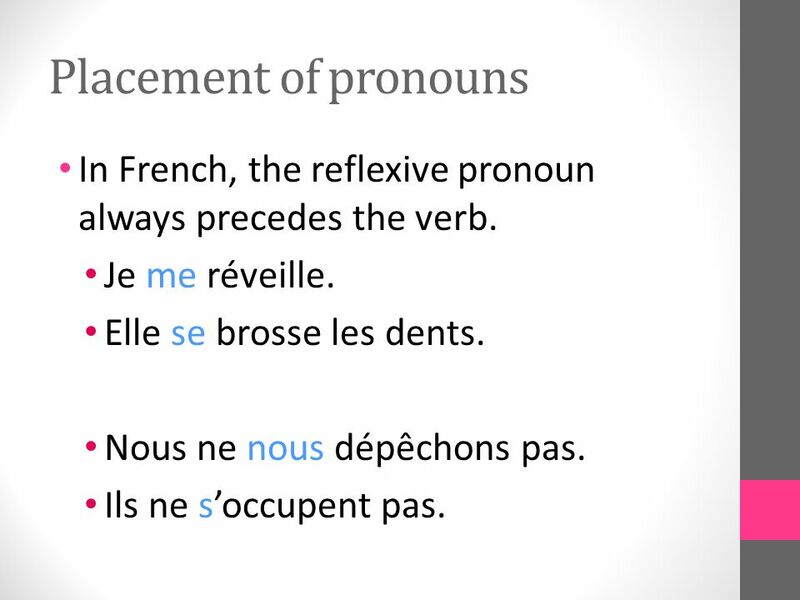 3 Reflexive Pronouns These pronouns are preceded by the noun, adjective, adverb, or pronoun to which they refer (also called an antecedent) in the same clause. 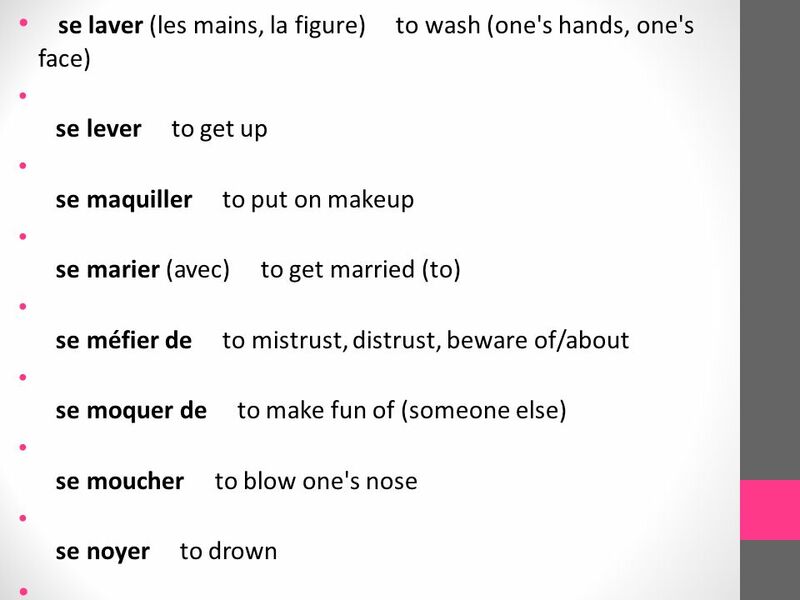 In English, these words are considered to be somewhat archaic, and they aren’t used often (especially not in reflexive verbs) myself, yourself, herself, himself, ourselves, yourselves, themselves In French, reflexive pronouns are called les pronoms réfléchis me te se nous vous se They match their antecedent, meaning that je takes me, tu takes te, etc. 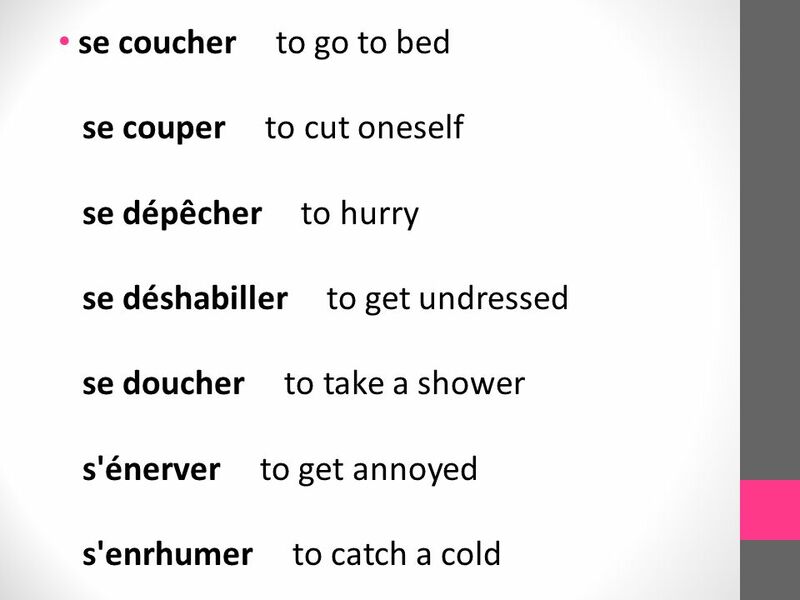 5 Reflexive Verbs in French Again, these verbs describe actions that happen to oneself. 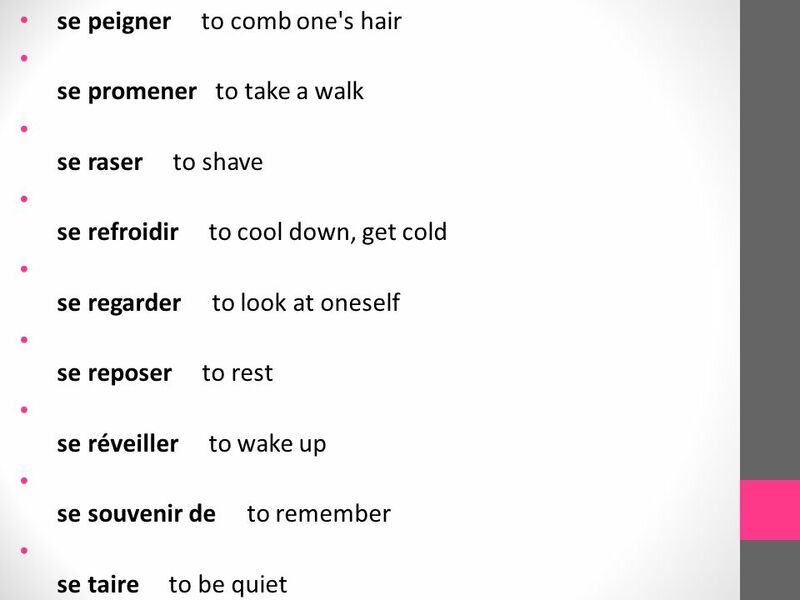 s’habiller se laver se brosser les cheveux se dépêcher (to hurry) se pardonner (to forgive oneself) s’occuper de (to busy oneself with, to take care of) In French, the reflexive pronoun is ABSOLUTELY NECESSARY. It cannot be left out as sometimes occurs in English. 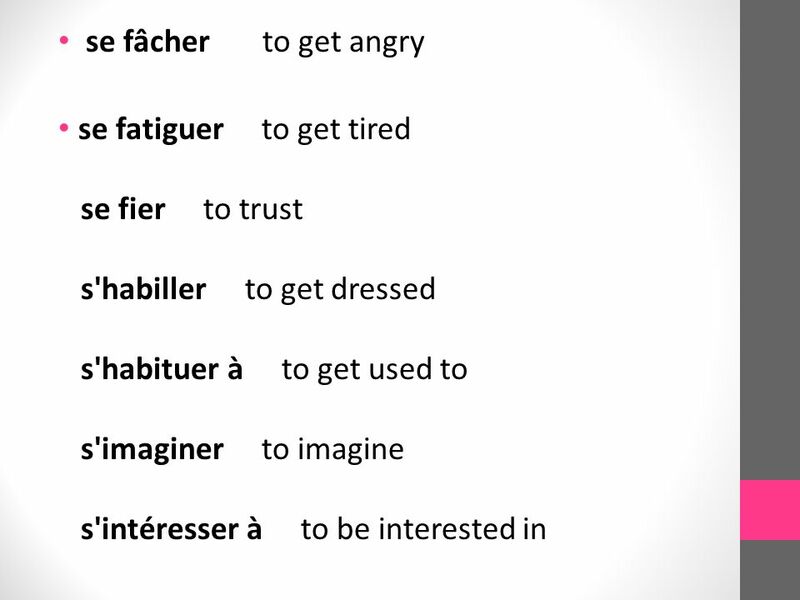 8 Placement of pronouns In French, the reflexive pronoun always precedes the verb. Je me réveille. Elle se brosse les dents. 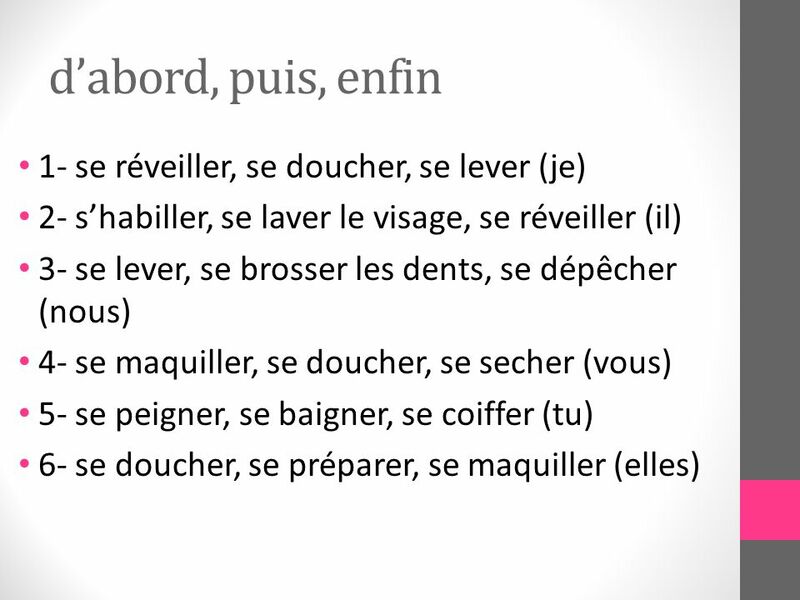 Nous ne nous dépêchons pas. Ils ne s’occupent pas. 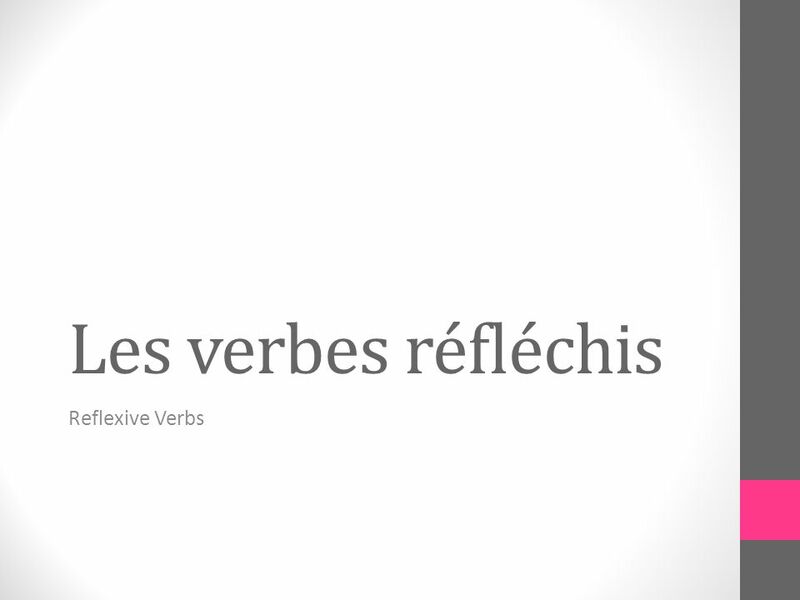 Download ppt "Les verbes réfléchis Reflexive Verbs. 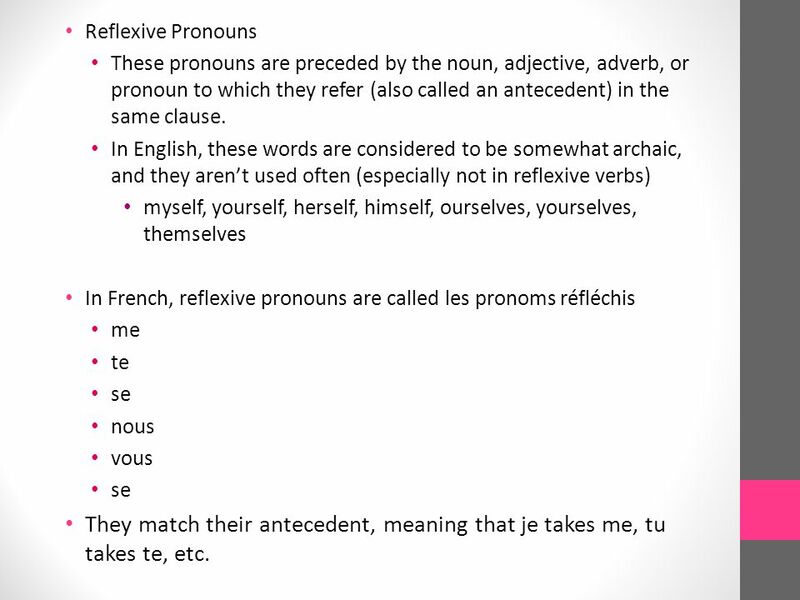 What are pronouns? 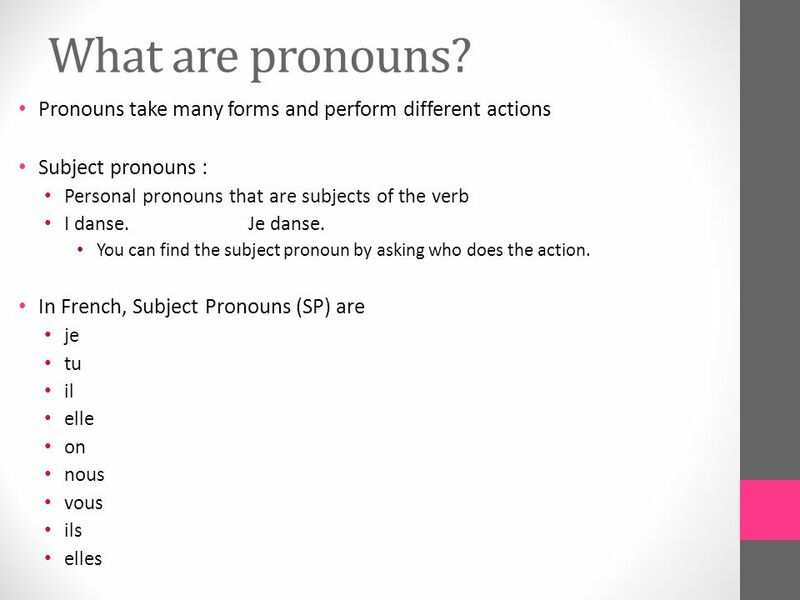 Pronouns take many forms and perform different actions Subject pronouns : Personal pronouns that." 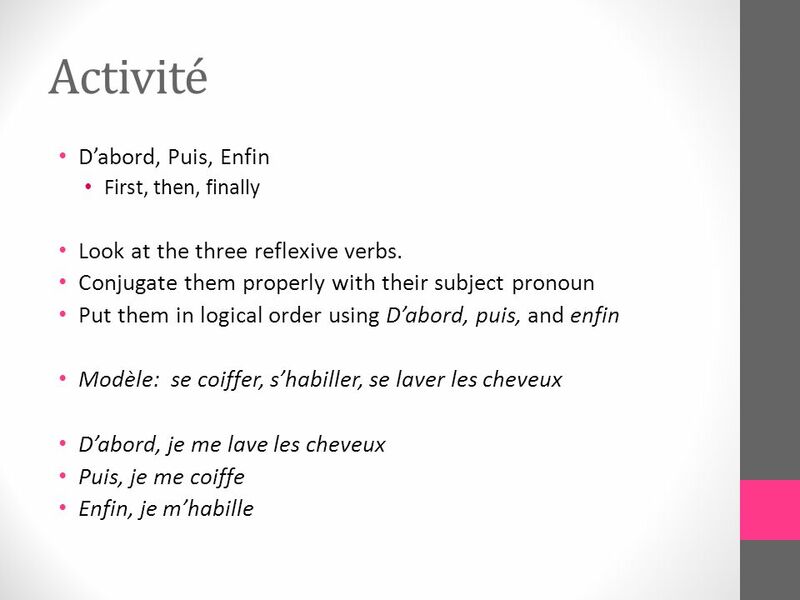 REFLEXIVE VERBS USE AND CONJUGATION. 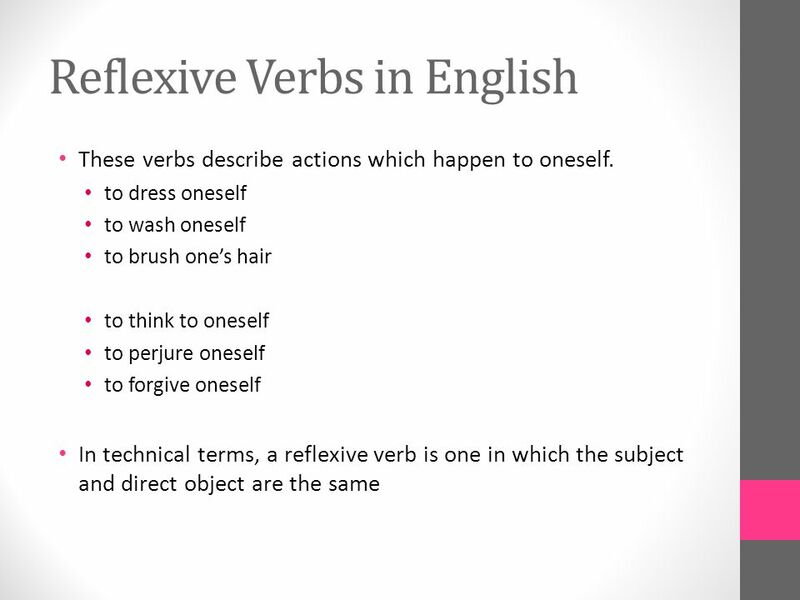 Strickly speaking, the term reflexive verb ought to refer only to verbs whose direct or indirect object, expressed. 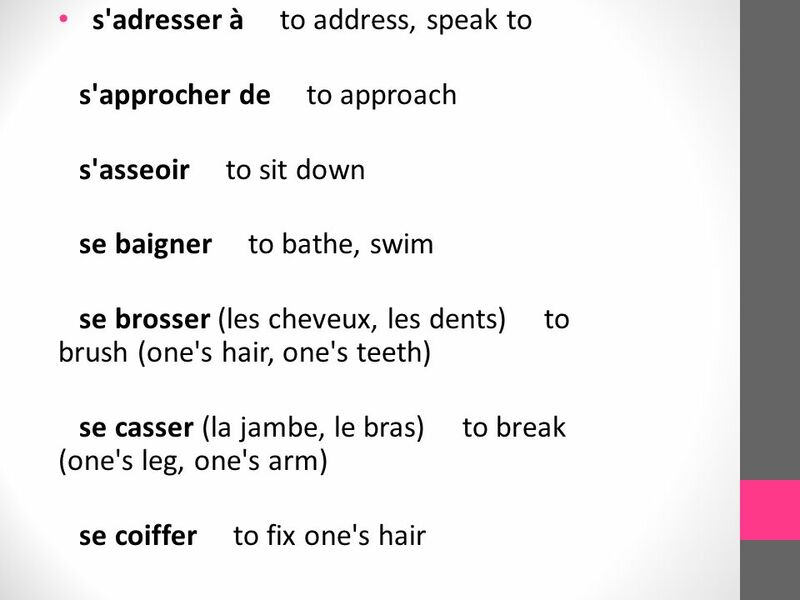 A Note the use of the definite article in the sentences below. R EFLEXIVE P RONOUNS & V ERBS The Relationship Between Verbs and Direct Objects. Chapitre 5. 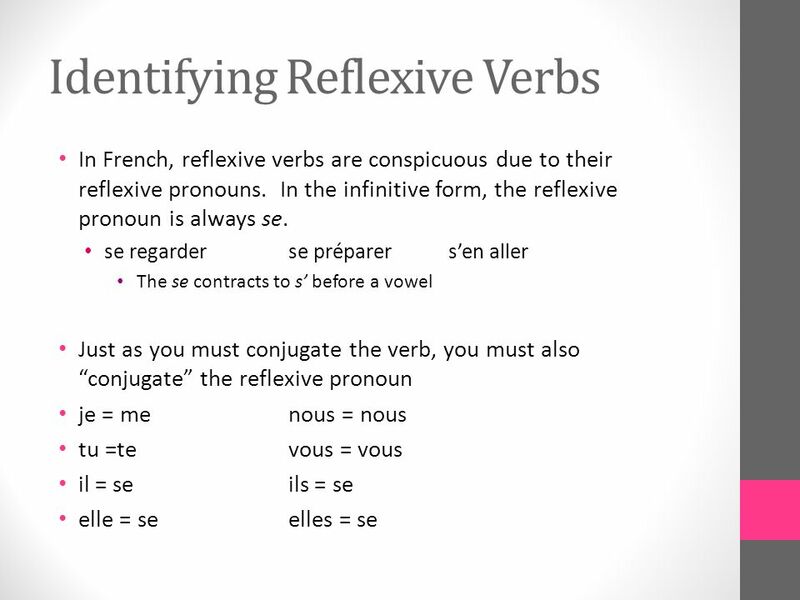 Reflexive Verbs Reflexive verbs are identified in the infinitive by the reflexive pronoun se. 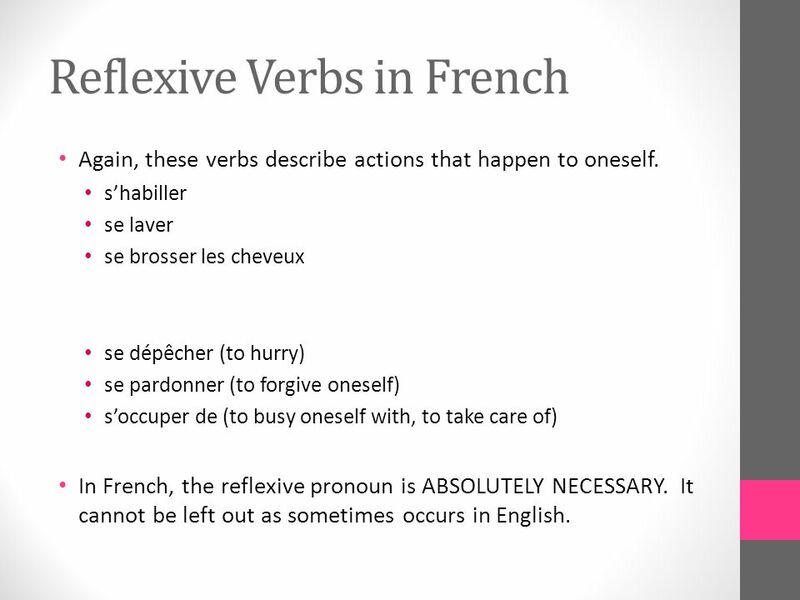 Reflexive verbs are used when the person doing. Français 2 1. In English, sometimes the action of a verb is directed – or reflected back on the subject. 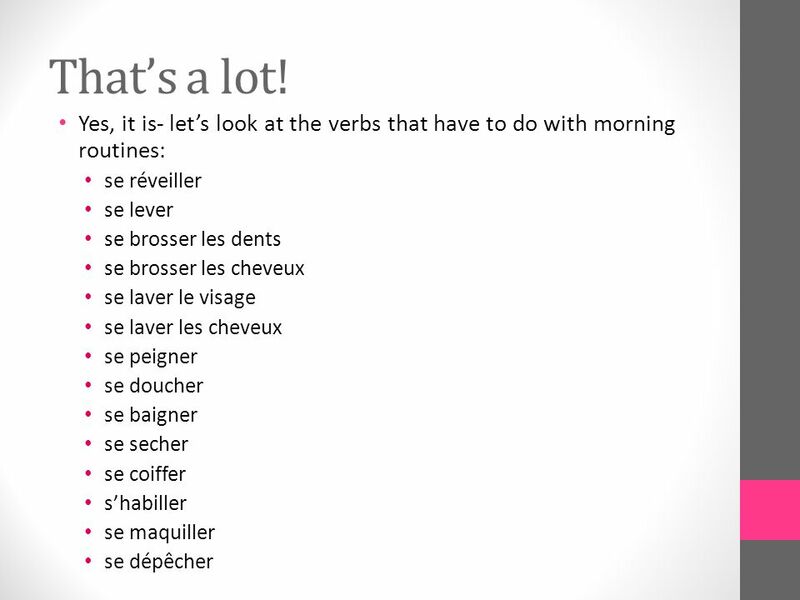 When this happens, the verb may be followed.